Gravy stuffing and sausage stuffing will be available on a first-come first serve basis at the shop and can be picked up alongside your order. 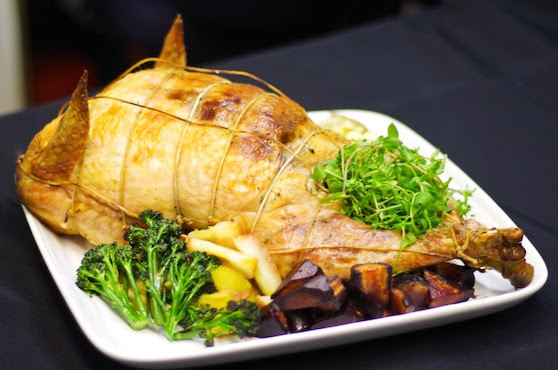 Our Free Range Package consists of a free range, hormone free turkey from Skye Hi Farms in the Fraser Valley, a free range duck and a Maple Hills hormone free chicken. The combined weight is around 13 to 14 lbs for $200. This is usually enough to feed about 12 to 15 people. 1 Bone for every 2 ppl with leftovers or without for big eaters. Fat Cap available on request. NOTE: We need about 2 days notice to prep turduckens and certain other items for you. We will be closed for the holiday Monday but will have extended hours during the weekend leading up to Thanksgiving. PS. We will not be able to change or adjust orders after October 1. Customers are welcome to add to their orders but any final adjustments can be made at the shop when they are picking up the order.